IDS is widely recognized for our unique & continuing focus on developing innovative & high quality products. We are driven to provide specialized doors that offer solutions, sustainability and durable designs to our clients while providing quality, an exceptional service at competitive prices. 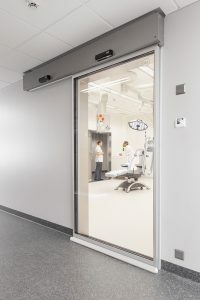 Additional to our wide range of products is Hermetically sealing sliding doors which are specifically designed for use in areas where hygiene and the control of air leakage is critical. 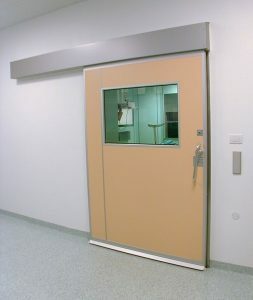 Hermetic Doors are the ideal solution for operating rooms, disinfecting rooms, clean rooms, other environmentally controlled rooms & various types of manufacturing facilities. 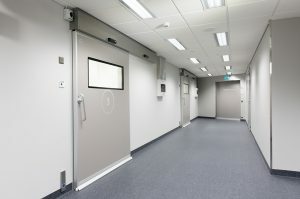 The doors operate on a track system which enables them to seal perfectly when closed helping to reduce cross contamination & saving on valuable space. Special IDS Hermetic Drives are used to automate the doors, touch-less sensors can be incorporated to minimize the spread of infection. Hermetic Doors are easy to clean requiring minimal maintenance, making them ideal in terms of upkeep. Frames can be supplied to suit various types of wall construction & thickness.